Add salad greens to large serving bowl. Top with turkey, sliced apple, and blue cheese. Place the vinegar mustard, maple syrup, and oil in a jar and shake until the dressing is well mixed. Season to taste with salt and pepper. Drizzle the vinaigrette over the salad and mix well. Top with the hazelnuts and apple chips. 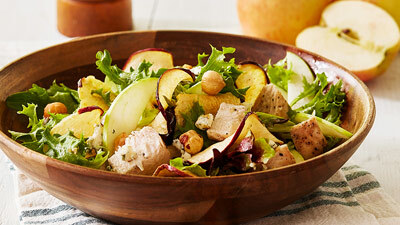 In a large bowl, toss together the salad greens and apples. Divide among 4 plates. Set aside. Add lemon juice, shallot, tarragon, vinegar, sugar, Dijon mustard, and olive oil to a jar and shake until well blended. Add pistachios and season to taste with salt and pepper. Set aside. Cut the goat cheese into 4 equal pieces. Gently pat into a disk shape. Repeat this process for the remaining goat cheese. Place the apple chips on a plate. Dip each of the pieces of goat cheese in the apple chips. Press each side gently, making sure that the apple chips are pressed into the cheese. Heat the grapeseed oil in a small skillet over medium high heat. Lightly fry the goat cheese rounds for about a minute on each side until they are lightly browned and are just slightly melted on either side but still retain their shape. Remove from oil and drain on paper towels. Top the salad with the fried goat cheese. 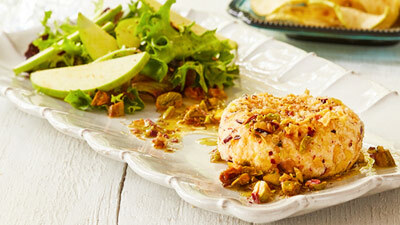 Shake the dressing again and spoon over the salads making sure to divide the pistachios among each salad. Pierce each sweet potato several times with the tines of a fork. Place the sweet potatoes on a rimmed baking sheet lined with foil. Bake until tender, about 45 minutes. While the potatoes are baking, mix the sour cream, maple syrup and cinnamon in a small bowl. Chill until ready to use. To serve, make a slit in the top of each sweet potato: push ends together to open. 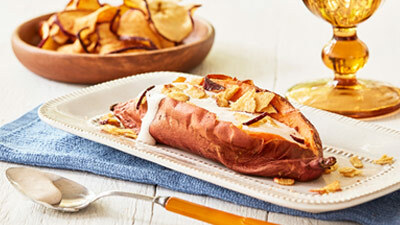 Drizzle the sour cream over each of the sweet potatoes and top with the crushed apple chips. Place the olive oil, garlic, mustard, vinegar, lemon juice and honey in a jar and shake until the dressing is well mixed. Season to taste with salt and pepper. Set aside. Place the salad greens in a large bowl. 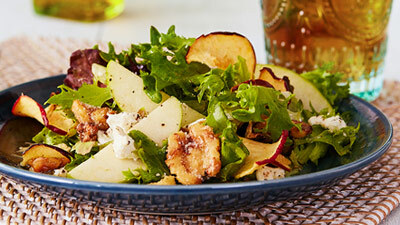 Add the goat cheese, candied walnuts, and apple chips. Toss with about 1/4 cup of the dressing. Serve immediately. Store remaining dressing in the refrigerator for up to a week.